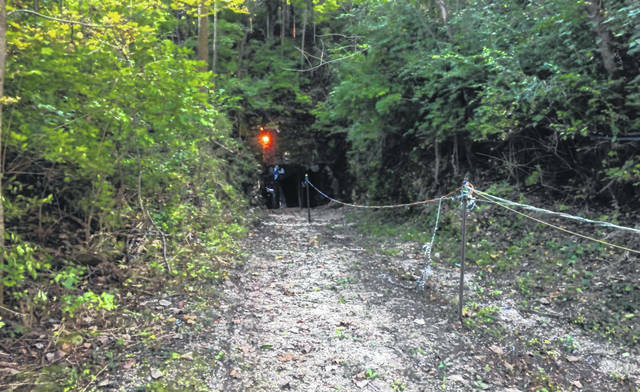 Lewisburg Haunted Cave voted No. 1 in U.S. The path leading to the entrance of Lewisburg’s infamous Haunted Cave, voted the best haunt in the country by the USA Today – 10 Best Reader’s Choice poll. LEWISBURG – The Lewisburg Haunted Cave won the USA Today – 10 Best Reader’s Choice Award as the No. 1 haunted house in the country. Nominees for the categories are chosen by a panel of relevant experts which include editors from USA Today, editors from 10Best.com, and expert contributors. This award came as a result of votes from the public, and countless hours of hard work from Lewisburg Haunted Cave employees. Make time to get down here. The Lewisburg Haunted Cave is open Friday and Saturday nights, now through the end of October. Both a walking haunted path and a non-scary, guided wagon ride are available. Why pay to park elsewhere, when parking is free at the number one haunt in the country? Don’t miss out on your chance to visit the best haunt in the U.S.